Because gum recession is a commonality as we age, we never really take the time to think about why this is happening. Genetics, poor dental hygiene and lifestyle habits can all play a part in you getting “a little long in the tooth”, and because of these reasons, we may fail to notice anything is happening. And since we will begin to have this recession as we age, is it something we need to treat? To read more about how gum recession needs to be treated, click here. Losing teeth is a natural occurrence that can happen to anyone at any age. Whether it be from an accident or because of poor dental hygiene, if you are missing a tooth/teeth, you have options. The problem is, dentures can lead to more issues due to denture movement. That is where dental implants come in. To read more about how you can be affected by dentures retention, click here. For more information about denture retention, call Dr. Cohen in Palm Beach Gardens, FL at 770-457-1351 or visit www.pbcperio.com. Now that we are in the midst of the new year, it is a good time to consider setting yourself up a dental appointment. After all, the holidays are over, and we’ve overindulged in all of the delicious treats that the time of year has to offer, and this may have done some damage to our smiles. In addition to a quick checkup, your dentist will also check for periodontal, or gum, disease. Periodontal disease is one of the most common dental issues, with 1 in 2 adults being affected. To read more about your periodontal evaluation, click here. For more information about periodontal evaluation, call Dr. Cohen in Palm Beach Gardens, FL at 770-457-1351 or visit www.pbcperio.com. It is not uncommon for us to lose a tooth or two over our lives due to things like accidents or tooth decay, but there is no need to fret. However, it is important to visit the dentist as soon as possible. If left untreated, it can not only cause problems chewing, but many other issues can develop as a result of your teeth shifting to make up for the loss. In this article, Dr. Cohen discusses what happens when missing teeth occur and treatment options available to you. To read the article, click here. For more information about treatment options for missing teeth, call Dr. Cohen in Palm Beach Gardens, FL at 770-457-1351 or visit www.pbcperio.com. It isn’t a mystery to know that people don’t like to visit the dentist. It’s tough enough to get the check-ups twice a year, so when something is going on inside our mouths, we will ignore it for as long as we can stand it. But what if you don’t feel ANY pain? How would we ever know to seek medical attention? In this article, Dr. Cohen discusses what happens when gum disease is left untreated. To read the article, click here. For more information about gum disease, call Dr. Cohen in Palm Beach Gardens, FL at 770-457-1351 or visit www.pbcperio.com. Did you know that October is National Dental Hygiene Month? It’s true! The same month that celebrates ghouls and candy is also the same month we need to pay attention to how we treat our teeth. One of the least favorite of these little dental chores is flossing. Not only did a survey conducted by the American Dental Association revealed that more adults would rather do something they find awful than floss, but the amount of times they floss is the biggest lie dentists hear on a day-to-day basis. Flossing is merely the act of wrapping a piece of string around your teeth, one by one, in order to remove any bacteria and excess material stuck between each tooth. The process itself is relatively simple. Cut yourself a piece of floss about 18 inches long. Wrap both sides around your fingers until you have a good two inches separating either side. Pull it taut between your thumb and index finger and guide the floss in between each tooth. With a downward zigzag motion, slide the floss around each tooth in a curved motion, to gently scrub down all the space between your teeth that your toothbrush can’t reach. Work from top to bottom or vice versa. Floss before you brush your teeth or after. You just want to get the cleanest mouth you possibly can each time you clean those pearly whites so that bacteria can’t glom onto your teeth and give you cavities or some other kind of gum disease while you aren’t looking. Preventative measures lead to fewer emergency dental visits. For more information about flossing, call Dr. Cohen in Palm Beach Gardens, FL at 770-457-1351 or visit www.pbcperio.com. Having crooked teeth can prevent you from smiling as much as you’d like. After all, your smile is the first thing people see. So, what do you do to fix those flaws? Whether your teeth are crowded, too far apart or have shifted, Invisalign invisible braces may be right for you. But there is no way to tell without the help of a dental exam. Upon an initial examination, your dental professional will come up with a treatment plan and an impression of your teeth will be taken in order to customize your first set of aligners. 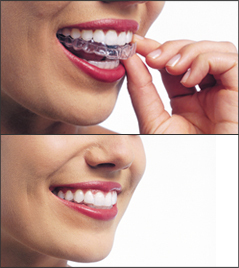 These aligners will move your teeth gradually week by week until you achieve the smile you have always desired. Unfortunately, not everyone is able to use Invisalign. Those with minimal amount of straightening are the most ideal candidates. Those with major work needed may need to stick to the traditional versions as they are the most effective with these cases. For more information about Invisalign invisible braces, call Dr. Cohen in Palm Beach Gardens, FL at 561-691-0020 or visit www.pbcperio.com. The LANAP protocol is a minimally invasive gum disease treatment that uses a specific dental laser, the PerioLase® MVP-7™. The LANAP protocol is the first and only protocol to receive FDA clearance for True Regeneration, which is re-growing new cementum, periodontal ligament, and alveolar bone, three components are needed for full oral function. Less post-operative pain. Using the PerioLase MVP-7 dental laser, the LANAP protocol helps avoid cutting and stitching of the gums. As a result, patients usually have minimal post-operative discomfort. Quicker recovery time. Most patients are able to return to their regular daily activities immediately following the procedure, which generally requires less than a 24-hour recovery period. Following traditional scalpel and suture surgery, recovery can take two to four weeks, during which patients can experience considerable pain and swelling. Healthy gums with minimal recession. When your gums are cut, the tissue shrinks and can show more of your tooth root. Because the LANAP protocol does not cut your gums, the tissue stays intact. For more information about LANAP protocol, call Dr. Cohen in Palm Beach Gardens, FL at 561- 691-0020 or visit www.cohen-dental.com. Exceptional Periodontic Treatment. Incredible Results. The Palm Beach Center for Periodontics and Implant Dentistry, P.A., provides a variety of surgical and non-surgical services. We pride ourselves on the fact that we are very conservative in our treatment recommendations and limit surgery to the areas where it is absolutely necessary. We cater to patients who are very anxious about dental treatment. Our practice offers Oral and IV Sedation to ensure a comfortable and pleasurable experience. The conservative approach we take with regards to treating periodontal disease revolves around proven periodontal principles. After completing our initial evaluation and determining the need for treatment, unless otherwise indicated, we begin Initial Therapy. This typically will involve Scaling and Root Planing (deep cleaning). In certain circumstances we will consider the use of adjuncts such as antibiotic therapy.